The traditional Infinity™ Smoking Receptacles feature all-metal construction to produce a sleek and attractive smoking litter management. 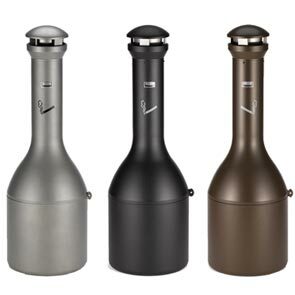 With models available in impressive colors, these smoking receptacles will match any environment regardless of its aesthetic. The weighted base and domed tops make the receptacle extremely stable and weather resistant in outdoor environments. The guidance tabs on the collars and bases enable simple removal and reattachment when cleaning or emptying, making the Infinity™ Smoking Receptacles ideal for long-term usage. Perfect for keeping areas clean while maintaining a classic look, Model 9W33 has a high-capacity cigarette count of up to 5,000 butts.